The rough gemstones which have been extracted from the gem fields needs to be cut and polished and this particular stage marks is pivot transformation from a rough stone to a precious gem this is gemstone processing, providing compleate deligence and richness in its looking and then it is ready to be fixed in the piece of jewelry or gems for jewelry it is gemstone polishing which gives it shining like glass. Skilled craftsmanship and highely precision manually operated cutting machines are compiled to give the rough gemstone appearance of a sparkling rich gem. The real quality gems are always natural stones and have not underwent any synthetic process ie. gemstone treatments like heat treatment. or heating, glass filling colouring etc. and these are the techniques which are applied on lower quality stones for their enhancement like- "Heat" can improve the clarity and color saturation of a gemstone; for example, citrine is made from heating amethyst. Tanzanite is almost always heated to remove brown undertones and to give it a sparkling blue or purplish saturated color. Gem stones are cut and polished in beautiful shapes and in different sizes before they are sold to stores or jewelry manufacturers. 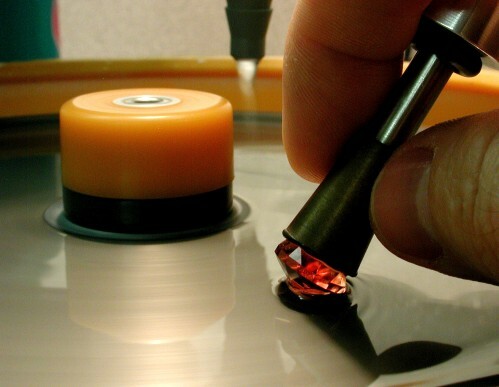 Here again there are two ways that gems are cut and polished. Opaque stones like and Lapis, Tigers Eye are cut as cabochons- highly polished and cut convexly but without facets. These are fashioned to reveal the precious stones' color and surface properties. Transparent or semi transparent and also all very precious gems like diamond, ruby, amethyst, emerald etc are usually faceted, which is cutting with a faceting machine tranfused with the artistic ability of the craftsman by polishing small flat windows at regular intervals and exact angles.